There are 2 things about me which has become quite apparent over the years. One, I love to eat and two, I tend to overorder. After some self reflection, here are some tips I've come up with to rein in the fats and spare the wallet. You can find them randomly everywhere. 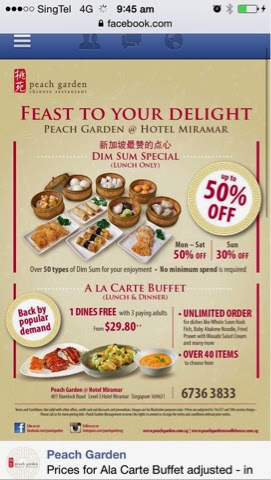 Just to name a few: Peach Garden is shaving 50% off its dim sum prices on weekdays. Morganfield's has an opening 1 for 1 ribs promotion in the month of Sept 2014. Ah Loy Thai is selling food vouchers at Deal.Com at a steal. Off peak discounts can be quite sizeable too. Keep your eyes wide open but only go for tried and tested restaurants. I dined at Agrobazaar's restaurant a few days ago and was deeply disappointed with their "opening specials". I went for a dim sum buffet at a 5 star hotel once. The price of the buffet was reasonable at SGD$45+++ per head but I almost fell out of my chair when I got the bill. Pickles, nuts and wet towels were charged as well as a hefty SGD8 surcharge for tea. Next time, I'll just politely decline these frills and skip to plain water instead, thank you very much. We went to Chili's last Sunday and the bill came up to almost SGD200. When the server came with the bill, I had to ask her for applicable credit card promotions before she told me Citibank offered 15% off. That's a SGD25 saving! Imagine if I had not proactively opened my mouth. Recently I also signed up for the Amex card, which comes with Feed at Raffles and Palate dining privileges. These privileges allow me to partake in hotel dining at a yummy 50% discount if the dining group comprises of 2 pax. Jaan here I come! Once in awhile, set meals offer better value than ala carte, especially if you are dining in a group. I find this especially true for big Chinese dinners. Appetizers and drinks are great as an ice breaker while waiting for the mains but tend to be overpriced and costly at many places. Exercise some restraint and the bill can be substantially reduced. 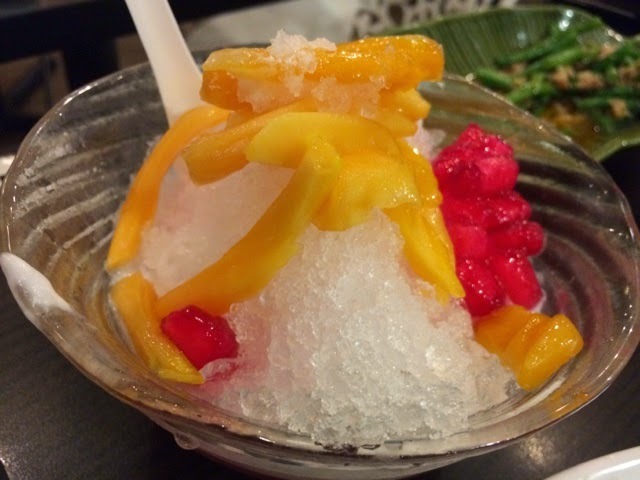 Order dessert last after polishing off the mains to avoid unnecessary wastage. Food that is shared tastes yummier in most cases. A little love never hurts. After regularly patronizing a coffee shop for its finger licking black pepper crabs, the owner automatically gives me a 10% discount when it is time to foot the bill.